LiDAR which stands for 'Light Detection And Ranging' is a remote sensing & surveying technology that measures distance by illuminating a target with a pulsed laser light. These light pulses combined with other data recorded by suitable Mapping systems generate precise, three-dimensional information about the shape of the Earth and its surface characteristics. LiDAR mapping, sometimes referred to as '3D laser scanning' is popularly used as a technology to make high-resolution maps, with applications in geodesy/geomatics, with terrestrial, airborne & mobile mapping methods. Mobile LiDAR is an advanced mapping solution that incorporates the most advanced LiDAR sensors, cameras and position/navigation/DGPS receivers to collect survey grade 3D point cloud data quickly and accurately. Survey Grade Mobile LiDAR mapping is the process of collecting geospatial data from a mobile vehicle, typically fitted with a LiDAR remote sensing systems. Such systems are composed of an integrated array of time synchronized navigation sensors (survey grade DGPS) and imaging sensors mounted on a mobile platform. The primary output after pre-processing from such systems include; geo-referenced 3D point cloud data, digital maps, images and videos. The overall accuracy of the data which can be easily achieved is about +/- 2 cm. 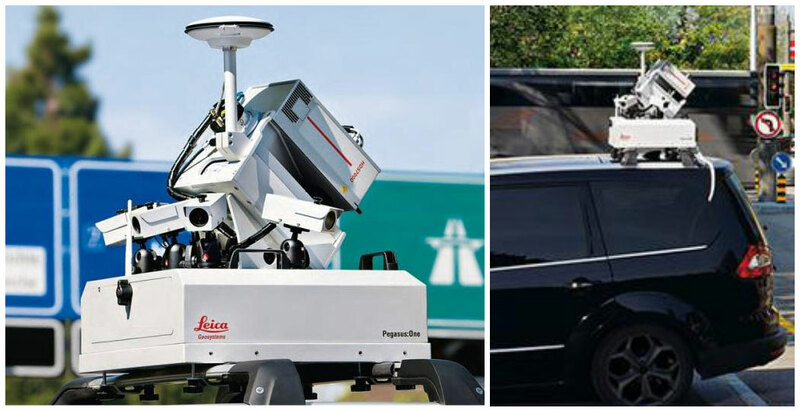 Prashant surveys has procured 'Leica Pegasus One & Leica Pegasus Two' Mobile Lidar systems and has capacity of capturing high precision data of upto +/- 2 cm about 360 Kms per day. 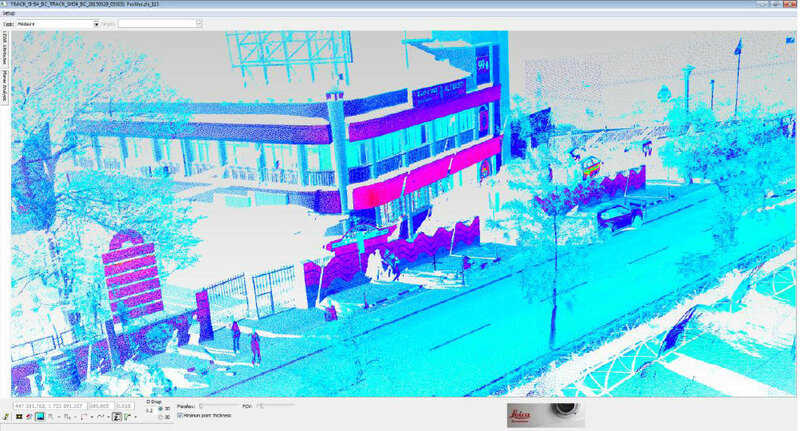 The Pegasus system captures dense 3D point cloud data with calibrated imagery and enables processing, visualization and mapping through user-friendly software platform "Leica Auto PP & Leica Map Factory Advanced". It provides plug-and-play hardware including cameras and LiDAR sensors, enabled by a software solution to control data acquisition, calibration, post-processing, viewing, editing and storage modules. Mobile mapping allows rapid collection of all visible assets from a moving vehicle driving at posted speeds. This cutting-edge Mobile LiDAR technology provides a rich, high-density dataset that measures about one million 3D points per second. This Leica Pegasus system gives a unique & complete Survey grade mobile mapping solution to our clients with high speed & accuracy. The system can be mounted on any four wheeler vehicle & can capture high precise data upto +/- 2 cm for about 100 Km of Highways in one day, which would have taken at least a month using primitive Electronic Total Stations (ETS) method. 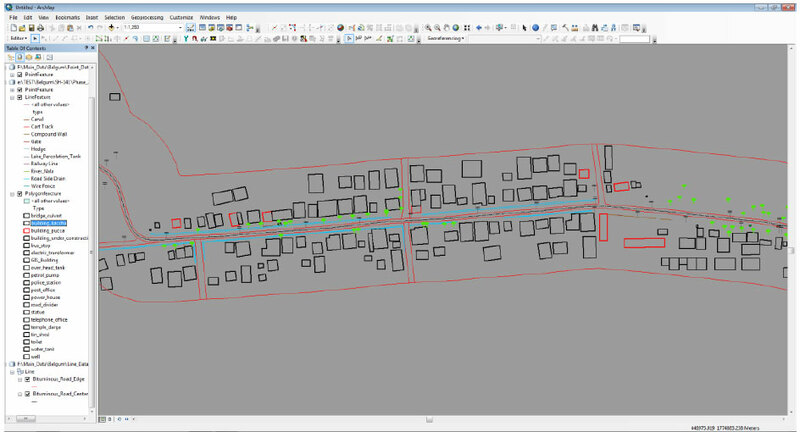 Further, after post processing & feature extraction of the 3d point cloud data, output in desired format like Autocad *.dwg or Arc GIS *.shp files can be obtained. We are the First in India to procure LEICA 'Pegasus One' Survey Grade, Mobile LiDAR System in March 2015. We have executed & submitted about 3,000 Km of State Highways Survey for PWD, Government of Karnataka by using Mobile LiDAR technology. Mr. Prashant Alatgi is an active participant for the technological update requested by NHAI, MORTH, Dwarka, New Delhi in April 2016 for finalizing the TOR of LiDAR Survey firms for carrying out the DPR/FSR projects of highways in India, using Survey Grade Mobile LiDAR Technology. Hexagon LIVE 2015 held in November 2015 at Hong Kong. 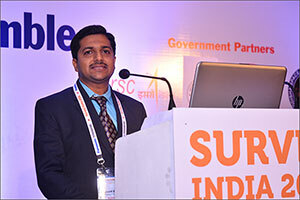 Geo Smart India 2016 held in March 2016 at Greater Noida, India. Hexagon LIVE 2016 held in June 2016 at Anaheim, Calafornia, USA. 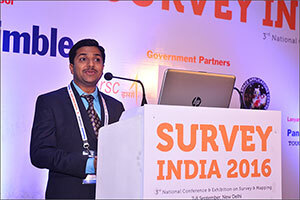 Survey India 2016 held in September 2016 by SAMA (Survey and mapping Association of India) at Delhi, India. 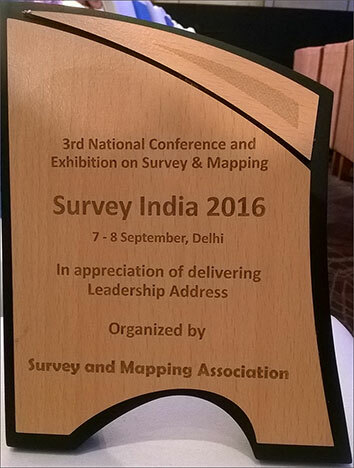 'Survey India 2016', held in September 2016 by SAMA (Survey and mapping Association of India) at Delhi, India. Field data capture can be done with great speed which gathers all required data point measurements in one pass, eliminating the need for additional mobilization costs. Mobile LiDAR gives the ability to collect up to 1 million points per second, compared to one point every few minutes with traditional Total Station survey technology, which save lots of time in field. Data Capture using mobile LiDAR is very efficient in sensitive areas or areas with extreme harsh climates. The captured data gives complete information about the site, with accurate point measurements and the ability to locate features that may be inaccessible with other methods. The data captured once can be used for different applications afterwards. Collected Pictures and images can be used to generate videos which can assist in decision making in the office, thereby reducing the frequency of site visits. Manpower required is considerably less, which adds to the savings in the overall project costs. Lesser chances of human error, process is more automated. The accuracy obtained is absolute, depending on the GPS and is not compounding in nature. Provides increased safety for project personnel and the general public because data can be collected remotely, removing the need for traffic diversion. System cannot be used in poor visibility due to rainfall, fog, snow etc. and requires direct line of site visibility while capturing the data. Not suitable for use in terrain without access / motor able roads. Raw data captured is large in size (about 80 GB for 100 Km road, with single run). Requires huge investments for hardwares, softwares and skilled manpower especially for ‘3d point cloud’ data processing work. For further detailed information on Mobile Lidar Survey, you can download our brochure from the "Download Mobile Lidar Brochure" link.